Isn’t it better to spend a little bit more now on the Mr. Coffee Café Barista Espresso Maker, instead of a lot more on Starbucks and Co later? Maybe you are already over your budget and decided to look for an affordable espresso maker to save some of your hard-earned money. Or you just want to indulge yourself with a wide variety of coffee specialties like an Iced Latte, Café Mocha or Caramel Cappuccino, just to mention a few. If one or even both of my assumptions coincide with your intend to purchase a high-quality espresso maker, look no further! 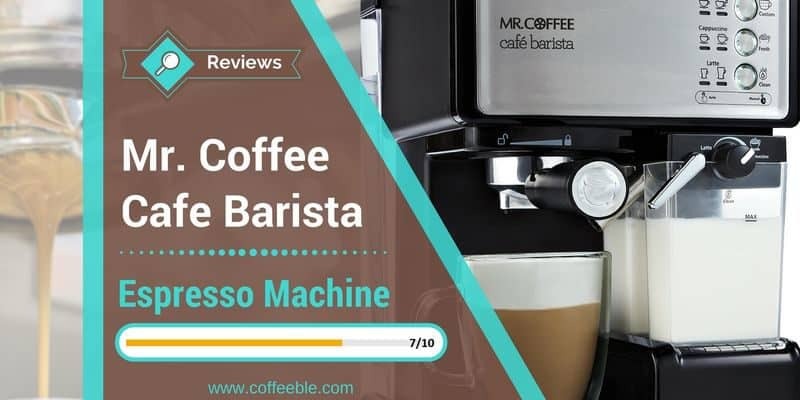 In this review of the Mr. Coffee Café Barista Espresso Maker you get the full report, pros and cons, the operation of the device and many more useful features to find out if this is the best espresso machine for your home. What I noticed right away is that like many other coffee or espresso machines in this price range, all inner components are protected in a black plastic housing. To give the semiautomatic Mr. Coffee Café Barista Espresso Maker a touch of luxury, the front panels were upgraded with a stainless steel look though it’s not real steel. Before you can start enjoying your espresso drinks you must prime your machine. Sounds complicated but is described very clearly – so don’t fear this challenge. You simply fill up both the water and milk tank with water and run a couple different cycles. That’s it. Included in the Mr. Coffee package is a Porta Filter, one Milk Reservoir, one Water Tank with lid, one filter for a single shot and one for a double shot and a measuring scoop/tamper. Additionally you get recipes for creative espresso drinks. The control panel has nine different functions and is divided into two parts. The left side of the buttons is the automatic selection of either single or double shots. The right side of the buttons is for the manual features like extra froth or cleaning. Each of the buttons is surrounded by a green LED light which illuminates or flashes depending on the current step in the cycle. Additional small icons with LEDs below that illuminate for each button pressed guide you to the espresso drink of your choice. The water and milk reservoir both have a clearly visible line for the maximum fill level. To prepare your espresso, you pour some coffee grounds into the Porta Filter and tamp it with the included measuring scoop/tamper. Then you carefully turn the Porta Filter towards the closed lock icon until it snaps in. Easy-peasy. The Froth Control Knob produces the amount of froth based on how much you turn the knob from left to right or from Latte to Cappuccino. Not enough froth? No problem! Just push and hold the Cappuccino button for a couple seconds and more froth is on its way. Now all you have to do is to select your preferred Espresso Drink and push one time for a single shot or two times for a double shot. 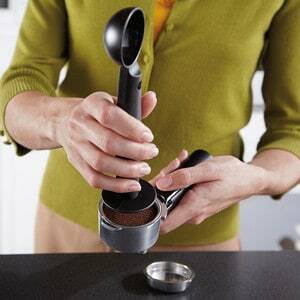 If you have a grinder you should only use beans and grind them right before you use them. Ground coffee from the shelf is not recommended since most of them are likely already stale. You can use all types of coffee, but it’s highly recommended to choose coffee that is marked as Espresso coffee. Why? Beans are beans and coffee is coffee? Well, it’s true, but Espresso is typically a blend of different coffees that can handle the higher pressure of water shooting through them. So to get the best possible flavor use the coffee that is prepared for being used for espressos. The two filters (One Shot + Two Shots) for this machine are included. You don’t need any other filter. One of the specifications of this Espresso Maker is its 15 bar pump. While the optimum pressure for espresso is around 8 to 10 bars, it seems that this machine handles it quite well since most reviewers love the taste of the espresso. All selected drinks are prepared within a minute. Therefore, it is not difficult at all for me to accept the not so perfect looking bonnet of milk froth. In three words: cleaning is a breeze! All parts except the Porta Filter and the water reservoir are dishwasher safe. I am not sure why the water reservoir but the manual clearly states it. The filter and water tank should be cleaned with warm water and soap. When using the Frothed Milk Dispensing Tube you must run one cleaning cycle after you are done. 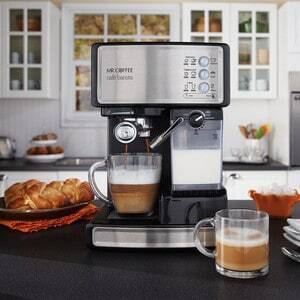 The Mr. Coffee Café Barista Espresso Maker is designed to make this process easy. At first make sure you have placed an empty cup under the frothing tube and check that there is water in the reservoir. 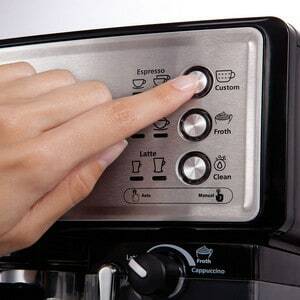 Now all you have to do is turn the Froth Control Knob to ‘Clean’ and hold the Latte/Clean button for about 3 seconds or until the pump starts. Blindingly easy, right? 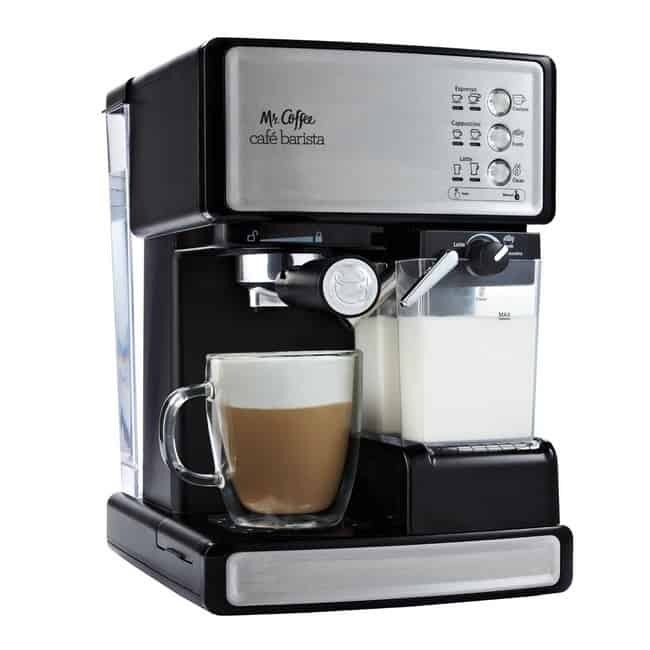 Is the Mr. Coffee Café Barista Espresso Maker with automatic milk frother one of the best espresso machine under $﻿﻿500? There are probably other machines that are as great as this one. But the amazingly simple way to use and the easy way to clean makes it really hard to not answer this question with YES. So thumbs up and bow down to Mr. Coffee for creating this user-friendly Espresso Maker for your home and kitchen! Tell me, do you have the Mr. Coffee Café Barista Espresso Maker?